It’s most likely that you’ve heard of dental implants by now. With dentists now offering the treatment nationwide, it has become fairly common for patients to look into getting dental implants. But, how do dental implants actually work? What will they do? Below we’ve provided some general information, but you can always visit our dental implants FAQs page for more in-depth information. Dental implants are fixed teeth that attach to the bone, and have a natural look, function and feel. Dental implants are recommended when a patient has missing teeth due to an accident, disease, trauma or even decay. There is no need for any special type of care for your dental implants as they should be treated just as you would treat the rest of your teeth. Brush and floss regularly while making sure to continue visiting our dentist in Pasadena for routine cleanings and exams. 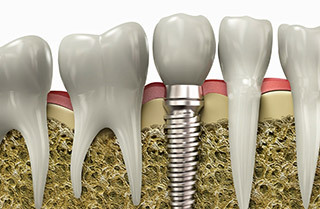 As dental implants are surgically implanted, they function like regular teeth. After the completion of the procedure, you will be able to eat, chew, speak and smile just as you did before. This is a great solution to recover your winning smile, so visit our dentist today in Pasadena, Dr. Vasag Bouzoghlanian, to see if dental implants are right for you!